Automatic incense making machine (4G). Production:60-80 kg. /8 Hr. (Depends on stick Quality). World’s high production up to 100 kg dry/8Hr.only. 9 monthswarranty in main motor, inverter Drive, Gearbox, DC card & Slider. Warranty 9 months warranty on main motor,inverter Drive,Gearbox,DC card & Slider. 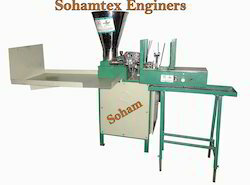 Nobody our Ex-partnerMachine Design copyright by sohamtex engineers. Machine Speed: 450 Stroke/minute Standard motor 2 H.P. New look of incense collector. Pressure adjustment valve at front side. Machine speed controlled by Autofeeder. Free:Tool kit, Rocket, cleaning rod, rocket rod, and machine manual. World’s high production up to 160 kg dry/8Hr.Only. 9 months warranty on main motor, inverter Drive, Gearbox, DC card & Slider. Machine design copyright by sohamtex engineers. • Indian Manufacturer & Exporter. • Hardened Gears & grounded shaft. • Heavy & Rigid Structure. • Quality control at every stage in machine manufacturing. • Long life die, Rocket, cleaning rod, rocket rod, and machine manual. • Spares available at any time. • Full Technical support after sales. • Oil-cooling system for piston. • Lifetime telephonic technical support free after sales. • Soundless and smooth working. • World’s high production up to 100 kg dry/8Hr.only. • Machine weight: 160 kg. • 9 months warranty in main motor, inverter Drive, Gearbox, DC card & Slider. Production Capacity 60-75 kg. /8 Hr. Warranty 9 months in Main motor,Ac drive,Gear box,DC Card & Slider. Free: 1 tool set, rocket, Cleaning rod, Rocket rod, machine manual. Warranty: 9 months in Main motor, Ac drive, Gear box, DC Card & Slider. This machine designed by our Engineer. Production Capacity: 60-75 kg. /8 Hr. Power Required 1HP three phase/single phase. Count of sticks per hour 8 inch-1000 pieces & 9 inch - 900 pieces. Production Capacity 40 to 65 kilos/8 Hr. 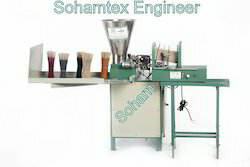 Machine design copyright by sohamtex engineers. Machine Speed: 180-200 Stroke/minute Production: 40 to 65 kilos/8 Hr. (depends on feeder) Counting: 8”-1000 pieces & 9”- 900 pieces. Required power: 1HP three phase/single phase. Length of incense: 8” to 12 Machine weight: 125 Kg. Lifetime telephonic technical support free after sales. Free: Tool Kit, Formula, Training of operating and general maintenance of the machine. Warranty: 9 months. (Main Motor, AC Drive, Gearbox, Slide, DC Card) Law Noise. Smooth Running. Easy to operating & low maintenance. Made in India. 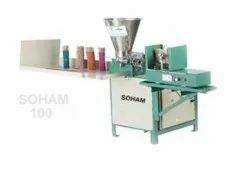 Production Capacity: 40 to 65 kilos/8 Hr. Production Capacity up to 135 kg dry/8Hr.only. Machine Design copyright by sohamtex engineers. Indian Manufacturer & Exporter. Hardened Gears & grounded shaft. Heavy & Rigid Structure. Machine Speed: 350 Stroke/minute Standard motor 1.5 H.P. (optional 2.0 H.P.) Problem less DC motor, DC Gear motor & Sensor (Compare to other) Quality control at every stage in machine manufacturing. Air-Cooled bowl housing. Oil-cooling system for piston. Long life die, Rocket, cleaning rod, rocket rod, and machine manual. Spares available at any time. Full Technical support after sales. Lifetime telephonic technical support free after sales. Soundless and smooth working. World’s high production up to 135 kg dry/8Hr.only. Counting meter. Machine weight: 160 kg.9 months warranty in main motor, inverter Drive, Gearbox, DC card & Slider. 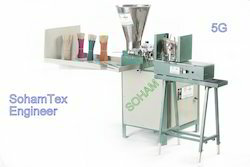 Incense Powder Filter Machine¿¿¿ Filter Time: 50 Kilogram Raw Powder With in 30 min.¿¿¿ Req. Power: 1HP (1 phase or 3 phases)¿¿¿ Easy To Operate¿¿¿ Heavy Structure¿¿¿ Law maintenance¿¿¿ Free: 1 Tool set¿¿¿ Warranty: 6 months¿¿¿ Law Noise.¿¿¿ Smooth Running.¿¿¿ Easy to operating & low maintenance.¿¿¿ Made in India. Production Capacity: 50 Kilogram Raw Powder With in 30 min. Looking for Agarbatti Making Machine Soham ?